Like English. Yes, English is easy. After all, I was speaking English when I was a baby. Take a glance here to see that the letters "ough" can have seven different pronunciations. And have you ever seen the word "ghoti"? Did you know it is pronounced "fish"? If you have no idea what I'm talking about, look here. Are you close enough to close the window? Do you wonder why a fire can raise a house to the ground? When an alarm turns on, why do we call it going off? There is no ham in hamburger, or egg in eggplant. Guinea Pigs are not from Guinea, nor are they pigs. Sweetmeats are candy, but Sweetbreads are meat. Dancers dance, but fingers don't fing. People recite at a play, but play at a recital. A slim chance and a fat chance are the same, but a wise man is very different to a wise guy. I know what unrequited love is, but have never heard of requited love. In English: I am / you are / she is. In Chinese: wǒ shì / nǐ shì / tā shì [我是 / 你是 / 她是]. This saves a lot of time when memorising ... I remember how many months I spent memorising the conjugation of verbs when studying German at school. And as I wind up my watch to get it started, I wind up this post to finish it off. OK.
And as the blog reader, please consider the following: It's easy to spend 30 seconds looking at a post and agreeing that the content might be useful to remember, and perhaps even easy to remember. But unless you actually take the time to remember, you have possibly wasted those 30 seconds. So take your time with new posts, and set a personal goal to not leave the page until you've memorised the content. And consider coming back for revision! Once I had decided to study Chinese, my next step was to choose between Mandarin & Cantonese. In retrospect, based on everything I now know, it should have been an easy choice. But I spent quite a lot of time reading, reviewing & debating. In case it helps you, here are some of the items I considered at the time. 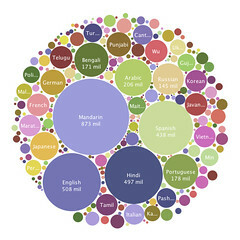 According to Wolfram|Alpha, there are approximately 1 billion people who speak Mandarin, of which nearly 900m speak it as their first language. Cantonese, on the other hand, is spoken by 55m people. Mandarin is by far the number 1 language in terms of the number of native speakers, and that's a good reason to speak it. And of the 55m who speak Cantonese, a large proportion also speak English. For Mandarin, this is not the case - so in terms of actually needing to speak Chinese, Mandarin is the clear choice. Mandarin has 4 tones (plus neutral), which is difficult enough for Westerners to grasp. Cantonese has 9 tones (plus neutral), which definitely makes it more difficult topick up. Even in Hong Kong, where Cantonese is the main language, in recent years it has been Mandarin that is now compulsorily taught (especially at international schools), and not Cantonese as I would have thought. Most of the material on the web for learning Chinese is Mandarin-based. It's not impossible to find Cantonese material, but the choice is certainly much more limited. I was visiting Hong Kong quite often, and Cantonese is the main Chinese language spoken there. Chinese restaurants generally seem to have Cantonese-speaking staff. Of course I'm generalising, but when I eat Chinese - in London, New York, Munich, Zurich, Johannesburg - they don't always speak Mandarin, just Cantonese. Life's never simple, and so even choosing Mandarin isn't enough - because there are many dialects which exist too. The most commonly-taught version is Standard Mandarin, known as Pǔtōnghuà [普通话]. And the good news is that most of the Mandarin course material on the Net seems to focus on this Standard Mandarin. Other variations include Guóyǔ [国语] which is spoken in Taiwan and is actually quite similar, Shangainese, Beijing dialect, and others. And if you have a different opinion to mine, let me know in the comments. So there I was, in a taxi from Taipei airport to my hotel, staring out the window. It was my first trip to Asia (I was on a business trip) and I was staring at the road signs, all written in Chinese. I noticed one sign which appeared at every exit to the highway: 出口. You don't have to be too smart to work out that the sign means something like "exit" or "offramp", and I asked my Taiwanese colleague about this the next day. The first symbol is 出 (chū) which means "outside". It's made up of two mountains (山)(shān). The next symbol is: 口 (kǒu) which means "mouth". In other words, it's the "mouth to the outside", or "exit". And it was intuitive that "mouth" should look like 口, that a mountain looks like 山, and indeed that "outside" could be represented by two mountains. She gave me another example. The character 王 (wáng) means king. Apparently, it comes from the fact that there is heaven, man, and earth - and those three dimensions are"connected" by the King.